I had a great time last week with Melissa Marr and Kelley Armstrong as we toured around NC in what we dubbed the Mini Cooper mini-tour. Yes, picture it: Three authors. Three bags of luggage. One mini Cooper. I still have bruises, lol. But as I said, we had a wonderful time. Our first official signing stop was at Malaprops in Asheville, NC. If you attended the signing, so glad you came out! If you missed it but would like to see it, Avon Books livestreamed the entire event. Go here to watch: http://ow.ly/6dDUy . The next signing stop was Barnes and Noble in Charlotte. This is the second time I’ve been to Charlotte for a signing, and thankfully, this time there wasn’t a terrible gale outside. We had a great group and it was a lot of fun. We even convinced author Carrie Ryan to join us on the panel! Our final signing stop was Chapel Hill, where I had a wonderful time meeting with several members of Frost Fans before the signing (thanks again for the cupcakes!). The signing itself was also a blast. Thanks so much to everyone who came out to the three events! You made it fun for us. 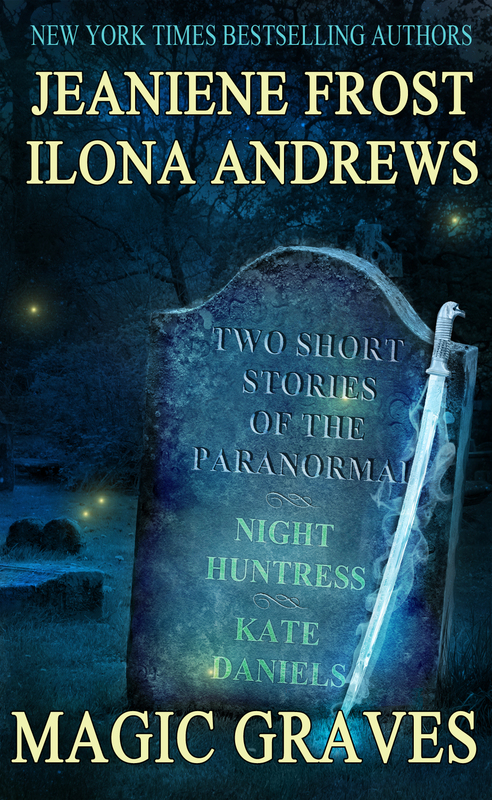 New York Times bestselling authors Jeaniene Frost and Ilona Andrews bring you two short stories of the paranormal. Jeaniene Frost’s story, One for the Money, features vampires Cat and Bones trying to protect a spoiled heiress with a price on her head and an undead hitman on her trail. Previously published in Death’s Excellent Vacation. Also includes the first three chapters from Jeaniene’s story in The Bite Before Christmas anthology, as well as a sneak peek at ONCE BURNED, the first novel in the new Night Prince series. 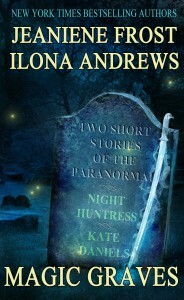 Ilona Andrews’ story, A Questionable Client, is a prequel to her award-winning Kate Daniels series. In a world beset by magic waves, Kate Daniels works as a mercenary. She is tired, hungry, and there is foul-smelling blood on her boots. All she wants to do is to go home, but when Mercenary Guild offers her a job she can’t refuse, she finds herself protecting a man against Russian wizards. Previously published in Dark and Stormy Knights. Also includes the first two chapters of FATE’S EDGE, book 3 in the Edge series, and first two chapters of Magic Grieves, a Kate Daniels novella. You can order Magic Graves for only $2.99 at Amazon , B&N, and iTunes. More retailers coming soon. Hope you enjoy! That’s it for updates at the moment. Back to writing Once Burned! Thank you so much for coming to Flyleaf Books. I enjoyed the evening so much and will treasure all the books you ladies graciously signed. Oh, and I grabbed the ebook yesterday. Thanks so much for the novellas and ALL the wonderful extras! Do you have any plans to come to the West Coast? We’d LOVE to see you in Southern California! Even though I had already read “One for the Money” I went ahead and bought Magic Graves for the samples of your future books. I am really excited now to see The Bite Before Christmas. Chapter three left a major cliffhanger! Once Burned was intriguing as well. I wondered what POV you would use. I’m glad you are telling it from Leila’s as it allows Vlad to keep some of his mystery. Can’t wait until you release it next year, the sample was enough to hook me! Sounds like you all had fun. Who did the driving? I wish I could have mad it to Charlotte. It would have been great to see you again and I would have loved to meet your companions. You need to stop by and see us at the usual place during TB or right after. I’m loving ONE GRAVE AT A TIME. Melissa drove the whole time. I’d drive, but that would get us lost, lol. Been crazy busy trying to finish this book so I’m not even caught up on True Blood this year. If I don’t make it for the last chat, I’ll try to pop up some other time once I finally finish the book.